Looking for hotels near Nowy Świat Street? Located 984 feet from Nowy Świat Street and 1148 feet from Nowy Świat - Uniwersytet Metro Station , LUXURY DESIGN Nowy Świat offers luxury accommodations in Warsaw. Guests benefit from balcony. 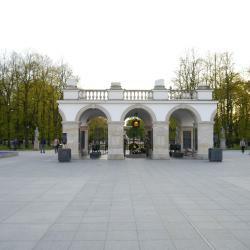 Located in the Sródmiescie of Warsaw, within a 13-minute walk of National Museum in Warsaw, DELUXE WIDOK 24 APARTMENT offers accommodations with free WiFi. Latte Apartment offers accommodations in Warsaw, 1312 feet from Nowy Świat Street. The apartment is 1312 feet from Parade Square. Free WiFi is offered throughout the property. This property is housed in a beautifully restored 19th-century building, only 656 feet from Warsaw's popular Nowy Świat Street. It offers luxurious suites with free WiFi. Hotel Indigo - Warsaw - Nowy Swiat is a 4-star, boutique hotel located in a renovated 19th century building, in the center of Warsaw, opposite the National Museum. Located 1312 feet from Holy Cross Church, Kapsuła Hostel Warszawa offers accommodations with free WiFi in Warsaw. Featuring a shared lounge, ibis Styles Warszawa City is located in Warsaw, a 17-minute walk from Zacheta National Art Gallery. Excellent location. Responsive staff. Modern, smartly designed rooms. Holiday Inn - Warsaw City Centre is located in Warsaw. Offering a restaurant, the property also features a fitness center and a shared lounge. Wonderful stay. Great room, amazing bed! Top of my list in Warsaw. I'll be back. Set in the very heart of Warsaw, among the capital's historic and cultural attractions, Sofitel Warsaw Victoria is a luxury hotel designed by Didier Gomez Studio. Great hotel, great location, friendly staff. Excellent breakfast. All was above expectations. This 4-star award-winning hotel is centrally located, just opposite the Palace of Culture and Science. Great hotel. Reasonable price, good location and wonderful restaurant. This property is housed in a beautifully restored 19th-century building, only 656 feet from Warsaw's popular Nowy Świat Street. It offers luxurious suites with free WiFi. Great residence-hotel. Nice staff. 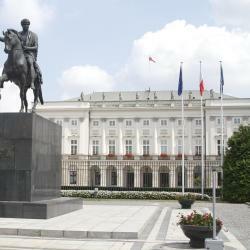 Welcoming guests since 1857, the renowned Raffles Europejski Warsaw features a prestigious location along the Royal Route, a few minutes’ walk from the 19-century Polish National Opera, and views onto... Everything was exceptional!!! Every single staff member went above and beyond. Located in the 16th century Bishops Palace in the vicinity of the Old Town of Warsaw, 656 feet from Royal Castle, Hotel Bellotto features air-conditioned rooms and private parking. Wonderful experience, I was upgraded in a magnificient suit, thanks for the stay! The 5-star, H15 Boutique Hotel is a part of an impressive, historic building in the center of Warsaw where in the pre-war times the Soviet embassy was located. Beautiful, modern and clean. Great location. Mamaison Hotel Le Regina Warsaw is a 5-star establishment that offers accommodations in the beautiful Warsaw’s Old Town. Perfect location excellent staff beautiful interiors and great spa services . Hotel Chmielna Warsaw is located in the heart of the city, on the well known Chmielna Street. The hotel houses a restaurant and offers free WiFi access. Warsaw Central railway station is 0.8 mi away. Staff was great. Location was incredible!! 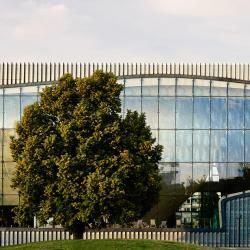 Enjoying prime location in the center of Warsaw, Hampton by Hilton Warsaw City Center is within a few steps of Warszawa Centralna Train Station, Złote Tarasy Shopping Center and Palace of Culture and... Rooms are very clean and well maintained.. Breakfast is very healthy and delicious. Hotels with great access to Nowy Świat Street! 4-star, boutique Hotel SixtySix is located in the historic house on famous Royal Route of Warsaw, right by Nowy Świat-Uniwersytet Metro Station. Great location, beautiful interior, excellent breakfast. Mercure Warszawa Centrum hotel is located in the city center, just steps away from Warsaw's famous landmarks such as the Palace of Culture and Science or the modern Shopping Center Złote Tarasy. Right next to the train station. Prefect location. Located in the center of Warsaw, within just a 7-minute drive from the beautiful Old Town Square, Mercure Warszawa Grand offers modern spacious rooms with an LCD TV and free WiFi. It was a business and trip, I stayed for 3 nights.